Venison burgers have been available for years in supermarkets like Tesco usually around the £3-£4 mark and available in Iceland occasionally like during the recent I’m A Celebrity series when Iceland brought out the Exotic Box selection but now it looks like it may be a permanent fixture. 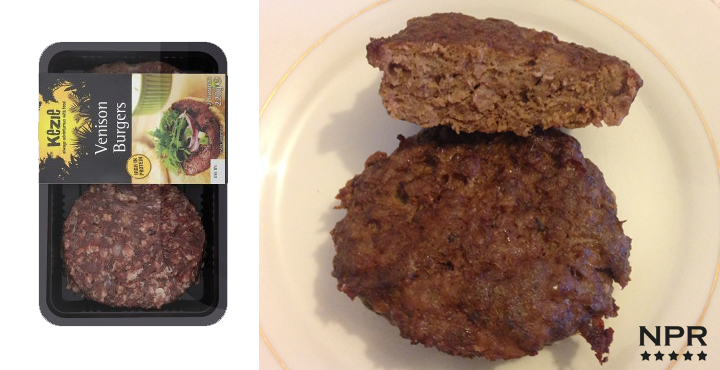 These pack of 2 burgers are quite thick, not large in circumference but thick and stay thick even after cooking and contain that rich almost pate like flavour that tastes like no other meat and this burger at times feels like meat inside instead of ground up pieces(which it is) but at the same time there is a fair bit of gristle in it, about 5-7 pieces per burger which can get annoying. If it wasn’t for the gristle it would be a great tasting burger for the price but the gristle brings it back to reality that this is still a low priced product.